BuckShot Manufacturing LLC is currently the ONLY authorized licensed distributor of the Patented and Trademarked Equalizer® Geared Leveling and the BuckShot BigShot® Treestands. Our roots date back to 1988, when BuckShot Inc., founded by Tom Graham Sr. and family began producing the now famous BuckShot BigShot®. Hundreds of thousands of the BuckShot BigShot Treestands have been sold over the years, and many are still in use to this day. 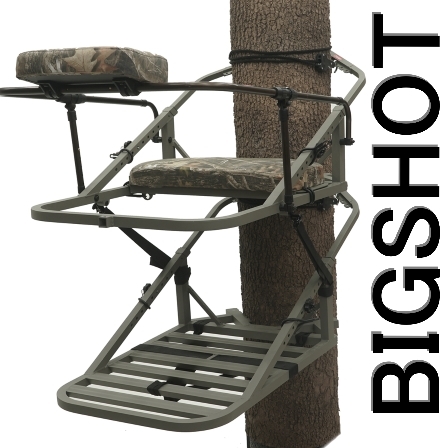 BuckShot Inc. began to design the unique Equalizer® Geared Leveling Treestand that revolutionized climbing treestands even its own BuckShot BigShot. In 2004 BuckShot Inc. Patented, Trademarked and introduced the Equalizer® Geared Leveling Treestand through BuckShot Inc.
Then in 2005 Equalizer Inc. was formed to be the online point of distribution. 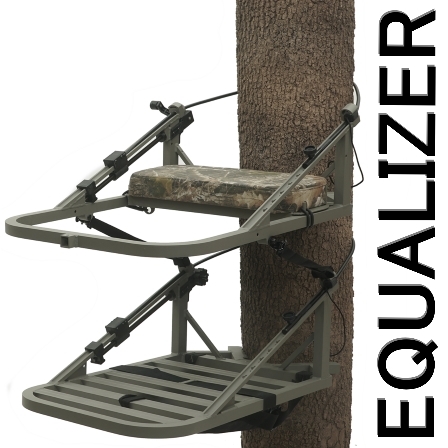 The Equalizer® Treestand revolutionized the way hunters climb trees. No more do you have to incline the treestand at extreme angles to start and no more guessing the right starting angle. Simply attach the stand to the tree level or slightly above level and start climbing. The Equalizer® Treestand provides a whopping 10" of cable adjustment, providing for a change of almost 6" tree diameter. BuckShot Manufacturing LLC was formed in 2012 to manufacture in the USA, but try as we might we did not make it to production. Now in 2017 we have the 'Original' Equalizer® Geared Leveling Treestand from our original manufacturer in Taiwan. The BuckShot Manufacturing LLC™ team is excited to bring back the three best treestands ever introduced to the Hunting Industry; BuckShot BigShot®, CenterShot™, Equalizer® Geared Leveling Treestands™. All Treestands are in stock and we are shipping daily. Beat the Rut and order NOW. We Welcome all comments and questions through CONTACT US.